Germanys minimal dance connoisseur, Steve Bug, started his DJ-career in a small after-hour bar near Ibizas Space back in 1991 - soon becoming resident DJ in the best club in his hometown Bremen and booked to major German events such as the Love Parade. After Volksworld, his first LP on Raw Elements, together with the mix compilations Da Minimal Funk Part 1 & 2 Steve puts the label to sleep in order to set up two brand-new platforms for vinyl releases Dessous and Poker Flat in 1999, followed by the launch of Audiomatique Recordings in 2004. Nowadays he is busy with labelwork and DJing around the globe. 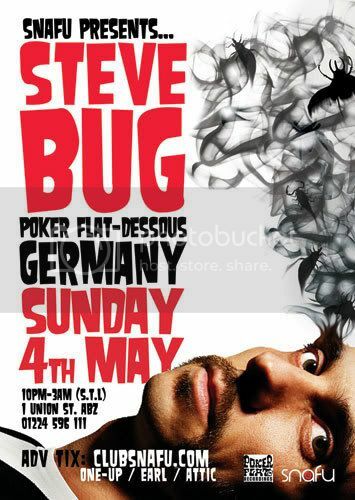 This will be Steve Bug's Aberdeen debut, look out for some of 'Bugs friends coming to Snafu soon.